In my preschool teaching days, I would search high and low for a book that grabbed my student’s attention and taught them something. If that same book stirred them to then go create or explore for themselves after we had closed the cover, well it quickly became a classroom staple. Lisa Hendey, in her usual deft, engaging, and humble writing, draws the reader (young and old) into many wonderful biblical history stories while weaving in the call to tell your own. A classic in the marking. This book is simply brilliant. This is a picture book for all ages, and one my family will read, again and again. I can see us using it to recall the great Christian history we are part of, while chronologically our own story. 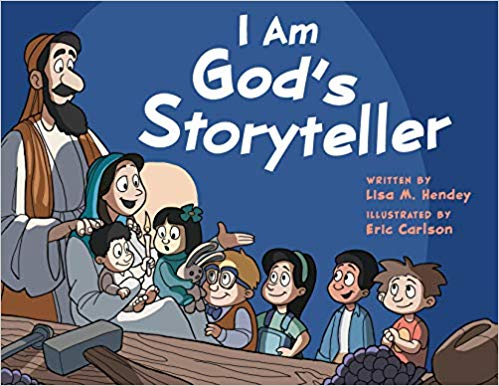 Want to learn more about I Am God’s Storyteller — a truly fantabulous new book? Visit Paraclete Press to read an excerpt, plus so much more! So sweet. Thank you for letting us know about the book. I always need more book ideas. This looks like a great book for kids! Fantabulous 😉 Love it! Thanks for the recommendation. This looks AMAZING!!! What a beautiful concept! This looks amazing. Those kind of books are hard to come by. I agree. Lisa Hendey is such a blessing! I love her Chime Traveler series for kids too.